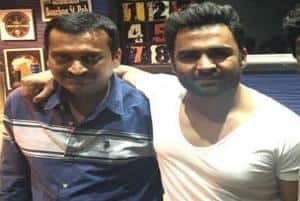 Actor-entrepreneur Sachiin Joshi has slammed actor-turned-producer Bandla Ganesh publically through social media. The duo landed in a rivalry over a cheque bounce. Apparently, the matter has not been resolved yet. Sachiin’s Vikiing Media had sent notices to Bandla Ganesh regarding the cheque that got bounced. The court has given bail to the Iddharammayilatho producer. But today the Temper producer shared a picture on Twitter with a quote, which read, “When people trust you, Every story u tell is a truth. But when they loose trust in you, every truth u tell becomes a story. Be Trustworthy. Good morning". Sachiin also replied after reading the tweet. He wrote, “But frauds like you cannot be trustworthy ever to anyone. More then fraud you are shameless, u dig in the same plate which gave you food”.